Multiple Entry and Exit Spirals allow loads to enter or exit the High Capacity Spirals and Wide Trak Spirals at intermediate elevations. This is a perfect application for multi-level warehousing and order picking operations. Loads can enter or exit the spirals at multiple elevations. This concept is also commonly used in applications where a single spiral is utilized for multiple production or packaging lines. 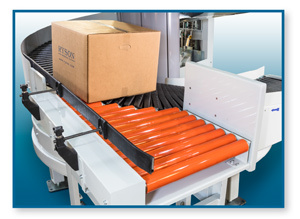 Ryson offers two different types of induction conveyors, depending on the type and size of loads to be handled. The belt type design has multiple belts of different lengths. The roller type utilizes powered rollers. Both designs match the spiral radius and are adjustable to match the pitch of the spiral, assuring a safe and reliable product transfer. The Divert Out Conveyors have a pivoting arm which incorporates a powered face belt assuring proper product orientation when diverting out of the spiral. The powered out feed conveyor is similar to the induction conveyor in that they have individually adjustable rollers that allows you to match the spiral pitch, assuring a reliable product transfer out of the spiral. The multiple entry and exit spirals are equipped with slats that have special rounded friction inserts. They provide just enough friction to prevent products from back sliding without preventing smooth side movement during induction or diverting out. Integrated traffic controls are required for all Multiple Entry and Exit Spirals. There are some limitations with regards to the placement (location) of these ancillary conveyors so we encourage you to contact the Ryson sales team for layout assistance early in your project. These conveyors are manufactured by Ryson and have the high quality and long life that our customers have come to expect from us. All Ryson Spirals are thoroughly shop tested prior to shipment, but they do depend on proper integration with the overall conveyor system for optimum performance and long life. For more details on the Ryson Multiple Entry Vertical Conveyors, please visit our Ryson YouTube Channel, or read current news and installation stories on the Ryson Blog. Multiple Entry or Exit Spirals from Ryson. Click on the video below to see an example of how the Ryson Multiple Entry Spiral can save you considerable floorspace.